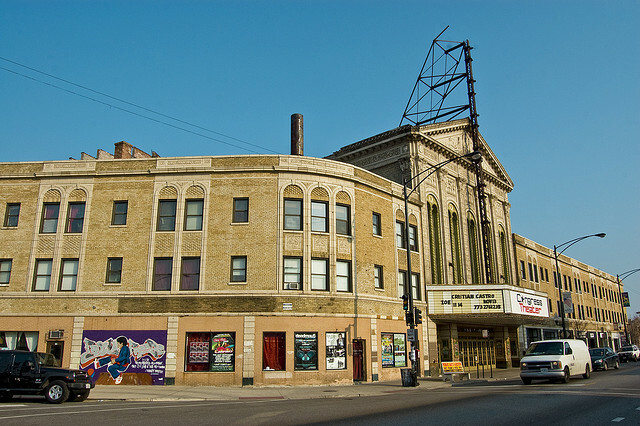 The Congress Theater, located at 2135 N. Milwaukee Ave., has been charged with five drug-related violations by the Chicago Liquor Control Commission. A Chicago Police Department official has accused the Congress Theater of failing to cooperate with officers during an investigation into underage drinking at the venue. Sgt. Joseph Giambrone testified that Congress staffers lied about serving alcohol when his unit arrived to investigate suspicions of underage drinking during a DJ Rusko set in the early hours of May 6, 2012. Giambrone’s testimony came during a disciplinary hearing at City Hall Tuesday morning, the second conducted by Chicago’s Liquor Control Commission looking into alleged illegal activities at the Congress. Giambrone said that when officers arrived on the scene, Congress managers Atieh Abdelhadi and Ahmad Mahidi met him outside the venue and denied serving alcohol during the show. Next, Giambrone said he observed Mahidi talking on his radio in “a language that wasn’t English,” and then witnessed Abdelhadi running ahead to unscrew taps in the lobby bar and place cups upside down over the spigots as officers entered the venue. Once inside, Giambrone claimed to see employees “activating tap devices” and serving “amber-hued” liquid to patrons by the stage. Giambrone said he was also present at the Congress on the night of April 13, 2012, when his unit responded to a large fight during a Chief Keef show. The venue did not call 911 to report this incident; defense attorney Harlan C. Powell hypothesized that venue staffers may have tried to call out to police officers already on the scene. To support his claim, Powell brought up a meeting that took place between Giambrone and the Congress Theater following these incidents. Powell said that during the meeting, venue personnel said they understood that any calls made to the police by the Congress would not be brought up in disciplinary actions. However, Deputy Hearings Commissioner Robert Nolan rejected Powell’s argument, stating that the events at issue occurred before any alleged conversations took place. Tuesday’s hearing was originally scheduled for March 6. But Powell – the third attorney to represent venue owner Erineo “Eddie” Carranza since his troubles with city agencies began in March of 2012 – requested more time to review the case from Deputy Commissioner Nolan. The next hearing is scheduled for April 30. Prior reporting by Jim DeRogatis. Research assistance by Jennifer Grandy. Leah Pickett blogs about pop culture for WBEZ. Follow her on Twitter @leahkpickett.